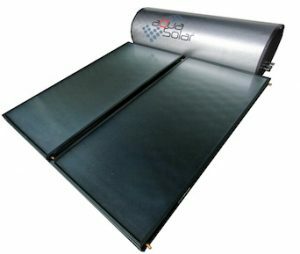 Installing a solar water heater system is a sound investment. Since it is virtually maintenance-free and doesnot cost a cent to run, you pay once for the simply luxury of using hot water. Compare this with your electricity or gas bills month after month. While they keep accumulating over the years, a solar water heater sustains itself on the infinite rays of the sun. Electrical appliances are generally guaranteed for only 36 months, but with a solar water heater, you and your family will be assured of cost-free hot water for years to come. More and more people are adopting environmentally friendly lifestyles. Solar water heaters complement this modern lifestyle by providing the simple luxury of hot water without exhausting the earth’s resources or releasing carbon into the air through consumption of electricity. 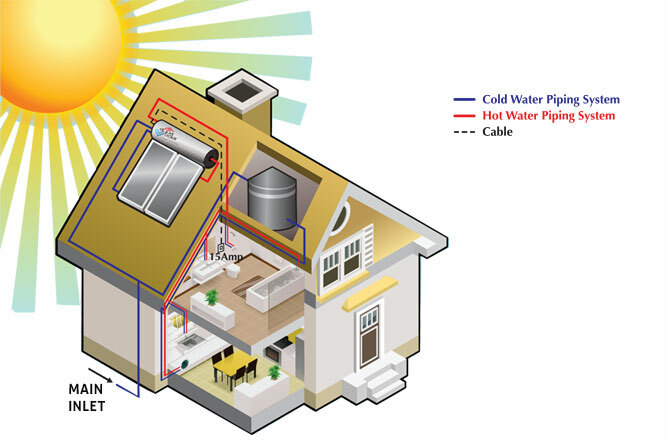 The solar water heater is the responsible choice for the modern consumer – an investment for future generations. The L series uses Thermosiphon system in heating. The absorber collector is placed below the storage tank, from which cold water flows into the collectro where it is heated to a desired temperature. When sun is on the Solar Panel, the water in the panel is heated, becomes less dense and rises up into the Storage Tank. This continuous natural circulation of the water through the collector and tank heats the tank water over time, as flow stops as soon as the collector cold below the tank temperature. How much do you save when you use renewable energy? The above chart is for reference only, the actual situation varies according to individual purposes. Aquasolar has absolutely no moving mechanical part in its system therefore is no problem of wear and tear. The tank itself is made of high quality stainless steel while the external casing is lined with aluminium to resist corrosion even after decades of use. That is why we have backed our product with 1 year guarantee and warranty for the remaining 9 years. I bath in cold water. Why do I need a water heater? Why not start? Bathing in warm water is certainly more pleasurable not to mention therapeutic than bathing in cold water. It opens up the pores and allows trapped dirt to be released. There are also more functions of a water heater than just for bathing. For instance, washing of dishes and clothes with warm water not only cleans better, it is also gentler on hands. Will the Aqua Solar unit fit on the root of my old house? The unit itself is mounted solidly on the roof where it receives maximum radiation from the sun. It is attached directly to a solid beam to allow it to stay firm even under the strongest of monsoon winds. A short period of rainfall will not affect the supply of hot water because AQUASOLAR’s tanks are insulated with 50mm of high-density polyurethane and fibreglass wool to retain heats. On an average, it heats water to about 70oC in the day and loses only about 8% of heat at night. Even if it is overcast, there is enough radiated heat to maintain the temperatures of the water at a comfortable level. However, if there are few days of cloudy day, it would require to switch on the backup heater. Do I need to switch on the backup heater everyday? The backup heater generally will only kick in if turned on when temperatures are maintained below 60ºC, the heater will auto cut-off if the temperature reach above 60°C. AQUASOLAR systems have no problems maintaining this temperature throughout the night due to its excellent 50mm High density Polyurethane foam insulation. Hence, you will only need to switch on the heater in case of bad weather or excessive hot water usage (visitors, etc). Or just keep it on and let the thermostat control it for you trouble-free. 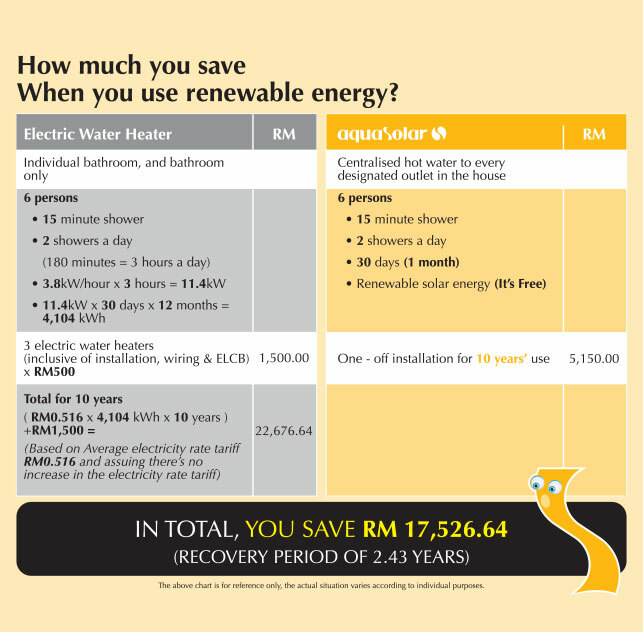 What is the payback/ROI of Aqua Solar water heating system? In a normal household of 4-6 people which spends approximately 20-40% of their electricity bills on water heating, the return on is usually within 3-5 years. Do I need to install a water pressure pump for the solar water heater? AQUASOLAR does not need to have a pump for it’s circulation through the system. Our solar system uses Thermosiphon system in heating, when the water is heated it rises. However, we are always recommend customer to purchase a pump for the cold water tank to increase the pressure of cold water for a better enjoyment. Which Aqua Solar model is right for your house? A. How many people in the house the typical hot water they use? B. The sizes of the house and number of bathroom? To choose the best water heater for your family, call your local Aquasolar expert who will help you pick the right unit for your current and future circumstances. 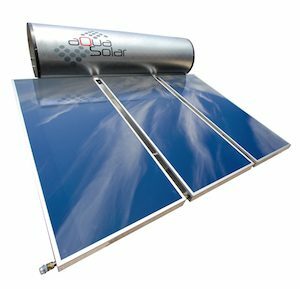 Why do solar water heater have booster? All solar water heater will have a backup booster to ensure hot water even during the raining season or over use of hot water. How much roof space will I need for a solar water heating system? Which position or direction is the best for absorption? Solar hot water system work the best on an south/north facing roof. It is also possible to install a solar hot water system on east and west facing roof, however this will reduce the performace of the system. Highest roof is the best location to place the solar system as no blockage of this area by buildings.